July 14, 2016 | 12:45 p.m.
A July 2016 flood caused severe damage to Saxon Harbor, along Lake Superior in Iron County. Heavy rainstorms in northwestern Wisconsin on Monday, July 11, led to flooding throughout the region, washing out roads across several counties and causing at least one deadly accident. The state Department of Transportation closed portions of multiple state highways, and Gov. Scott Walker declared a state of emergency in Ashland, Bayfield, Burnett, Douglas, Iron, Price, Sawyer and Washburn counties. The flooding also poses a less visible, but still significant threat: It can result in more contaminants in the area's drinking water supplies. Despite bordering Lake Superior, northwestern Wisconsin overwhelmingly relies on groundwater for its drinking water supply. About 25 percent of Wisconsinites get their drinking water water from private groundwater wells, which are especially predominant in more rural areas. Unlike public utilities, private wells aren't subject to similar regulations at state and federal levels, and their owners bear the responsibility for the monitoring and ensuring the quality of their water. Here's how flooding can affect well water supplies, generally and in the context of the July flooding in northwest Wisconsin. Why are floods threatening to well water? Contaminants like bacteria and nitrate flow from the surface into groundwater supplies from farms, septic systems, and other sources, aided by rain and simple gravity. A sudden downpour like the 10-inch flash flood that inundated northwestern Wisconsin on July 10 only speeds up that process. The Wisconsin Department of Natural Resources warned in a press release that "well owners who observe flooding or changes in their water should assume their wells are contaminated," but wells in areas that don't show obvious signs of flooding could be in danger too. A wide swath of northwest Wisconsin was inundated with 10 inches of rain on July 11. Residents should not, however, expect wide-scale contamination of the region's groundwater. "Most likely [the impact] is going to be scattered," said Jason Fischbach, an agricultural agent with University of Wisconsin-Extension Bayfield County. People should be most concerned he added, if they notice water pooling near their well casing. In some cases, the rain and floodwaters moved so quickly that they didn't have much time to permeate into a wide area of ground. "It's sort of like watering your garden with a firehose on full-blast," Fischbach said. What about people who get water from a public utility? Except for customers of Ashland and Superior's water utilities (about 40,000 people total), which source from Lake Superior, most northern Wisconsinites are drinking groundwater. The DNR's press release noted that public utilities are "designed and operated to keep out contaminants," but that is not the full story. Wisconsin water utilities vary widely in which treatment processes they do and don't carry out. In fact several utilities in the counties hit by flooding — including the city of Washburn's — do not currently disinfect their water to knock out bacteria. Water utilities have many reasons for why they choose not to carry out a disinfection process like hypochlorination or ultraviolet-light disinfection. First, if they use groundwater, federal and state regulations don't require them to do so. One reason is a long-held premise that groundwater is less susceptible to bacteria and virus contamination — an assumption that recent research in Wisconsin has upended. There's also the matter of cost: Smaller water utilities don't have sufficient budget or staff, and their municipal governments may not want to raise rates. And some people just don't like the idea of adding chemicals to their water. Public water utility customers do have an advantage in the case of catastrophic flooding, though, because utilities have the resources (and a regulatory obligation) to monitor their water for bacteria and other contaminants. Additionally, even a community with modest resources might be able to provide emergency funding for improved water treatment if there's a need and enough public pressure to do so. People who use private wells must do it themselves. None of this is to say that residents in the affected northwestern Wisconsin counties should panic about their drinking water if they use wells. But they can take basic steps to make sure their water supply is safe. Well users can have their water tested, and utility customers can contact their providers and look up their treatment practices and testing results in the DNR's searchable database. 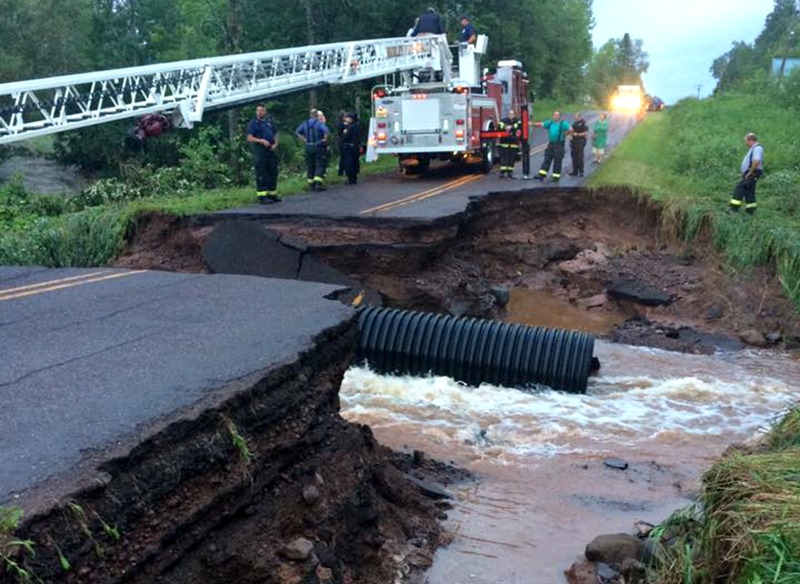 Multiple roads in northwest Wisconsin, including County Road B in Iron County, suffered severe damage in the flood. What precautions can well owners take, and what resources can help them protect their water quality? Above all, private well owners need to inform themselves about potential water contaminants in the state and in specific local areas. The Well Water Quality Viewer, created by the Center for Watershed Science and Education, offers extensive searchable data on test results from private wells across the state. UW-Extension groundwater specialist Kevin Masarik has written a guide to determining appropriate tests for a specific well, and public and private labs can test samples and help with analyzing results and offering additional information about options. The DNR offers a series of recommendations, for well owners deailng with flooding, including links to certified testing labs and companies that can help maintain and disinfect private wells and plumbing systems. For people who grow their own food, UW-Extension has a guide to help ensure produce from flooded gardens is safe. Ongoing updates about the flooding in northwestern Wisconsin are being provided by Wisconsin Emergency Management. The DNR and state Department of Health Services offer additional information about coping with and recovering from floods, including a Wisconsin Flood Toolkit, and UW-Extension offers a Disaster Handbook and online guide to disaster management and recovery.